Once a working shoe factory at the turn of the century, the Craddock Terry Hotel and Event Center has since been transformed into a one-of-a-kind luxury hotel that offers a stylish getaway in downtown Lynchburg, Virginia. 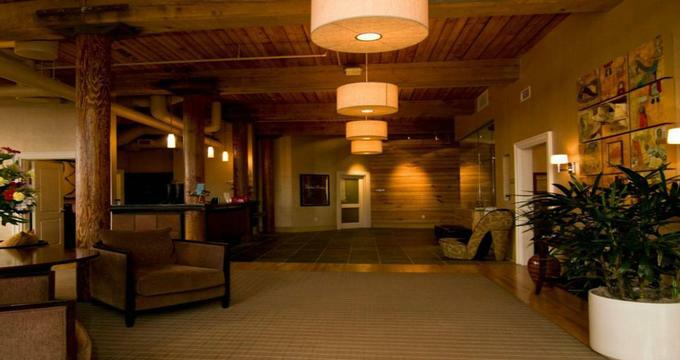 Boasting the original brick warehouse architecture, the hotel combines historical artifacts from the Craddock-Terry Shoe Corporation with contemporary style with charming details. Deluxe accommodations are beautifully furnished, two award-winning restaurants serve outstanding cuisine, an onsite micro-brewery presents some of the region’s finest brews and sophisticated meeting and events venues provide 4,000 square feet of flexible space. The Craddock Terry Hotel and Event Center pays homage to its rich history and origins as a shoe factory through whimsical touches and creative details throughout the hotel. The hotel’s décor is accented with a combination of historical artifacts and modern artworks, and a unique collection of shoe memorabilia reflects the building’s unique heritage. Shoe-shaped signs label each guestroom door, complimentary in-room continental breakfasts are delivered to guest rooms every morning and served in old-fashioned wooden shoeshine boxes, and shoeshine services are available upon request. 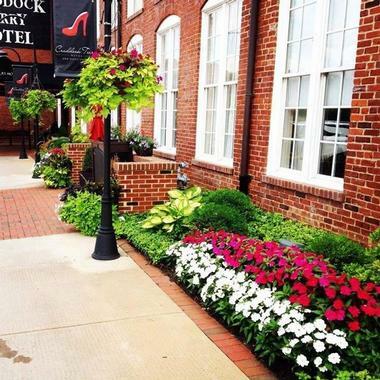 Located on the banks of the James River in downtown Lynchburg, The Craddock Terry Hotel and Event Center is ideally located for exploring the town and surrounding region. The hotel is near the Amtrak train station and routes 29 and 460 and is only six miles from the Lynchburg Regional Airport (LYH) and 45 miles from Roanoke Regional Airport (ROA). 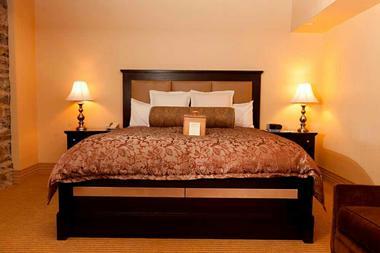 Historic charm meets contemporary luxury in the accommodations at the Craddock Terry Hotel. The hotel features 44 guest rooms and suites with exquisite architectural elements such as granite stone or exposed brick exterior walls, soaring ornate ceilings, whimsical décor and sweeping views of the James River, downtown Lynchburg or the Blue Ridge Mountains. All lodging feature modern amenities, including flat-screen televisions with premium channels, alarm clocks with CD players, telephones with complimentary local calls, in-room safes, mini-fridges, Keurig coffee makers with coffees and teas, and complimentary high-speed wireless Internet. Continental breakfasts are delivered to guest rooms and suites each morning, and guest services include daily housekeeping. Standard Suites and King Suites are spacious and light with king-sized beds in luxurious linens, Vermont Castings electric fireplaces, and private en-suite bathrooms with oversized walk-in showers, separate Kohler whirlpool bathtubs, his and hers bathrobes, and deluxe bath products. Separate sitting areas have plush sleeper sofas for extra guests, comfy armchairs, two flat screen televisions with premium channels, and a separate wet bar area with comfortable seating, mini-fridges, and Keurig coffee makers with coffees and teas. Work desks have complimentary high-speed wireless Internet and large windows offer beautiful views of the Blue Ridge Mountains. Located in the William King Building, Premium King Guestrooms features stunning nine-and-half foot ceilings, king-sized beds in luxurious linens, Vermont Castings electric fireplaces, and private en-suite bathrooms with oversized walk-in showers, separate Kohler whirlpool bathtubs, his and hers bathrobes, and deluxe bath products. Modern amenities include flat-screen televisions with premium channels, mini-fridges, and Keurig coffee makers with coffees and teas. 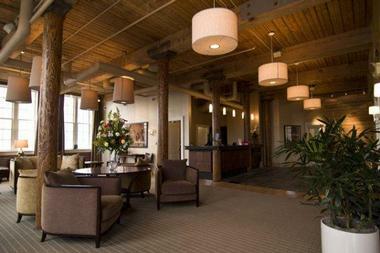 Work desks have complimentary high-speed wireless Internet and large windows offer beautiful views of the James River. Deluxe King and Queen Guestrooms offer king or queen-sized beds with luxurious linens, and private en-suite bathrooms with oversized walk-in showers, separate Kohler whirlpool bathtubs, double vanities, his and hers bathrobes, and deluxe bath products. Sitting areas feature flat-screen televisions with premium channels, mini-fridges, and Keurig coffee makers with coffees and teas. Work desks have complimentary high-speed wireless Internet and large windows offer beautiful views of downtown Lynchburg. The Craddock Terry Hotel and Event Center offers guests two distinctive dining experiences and an excellent in-room dining menu. The Bluffwalk Center offers a casual, relaxed venue to gather and enjoy drinks before heading to one of two award-winning restaurants. The Shoemakers American Grille presents a chic, uptown ambiance with exposed brick interior walls and sleek, inviting décor and serves a menu of fresh seafood, flame-grilled steaks, and prime rib, freshly prepared and presented in an open kitchen. The Grille is also home to an impressive bar and lounge that offers an elegant spot to relax over handcrafted cocktails, craft beer, fine wines and malt whiskeys from around the world. A sunny open air courtyard offers alfresco dining during the summer season. Boasting distinctly industrial décor with dark timber beams, exposed granite block walls, and an airy atrium, Waterstone offers a fresh and unique approach to fine dining. A bustling open kitchen allows diners to watch the process of creating the dishes on the creative menu, which features a variety of delicious, made-to-order wood-fired pizzas, garden fresh salads and grilled Panini and focaccia sandwiches stacked on freshly baked bread. The delicious cuisine is accompanied by a variety of signature cocktails, craft beer, and local and international wines by the glass or bottle. Guests can enjoy dining in the comfort and privacy of their rooms from a specially designed in-room menu that features selected dishes and drinks from both restaurants. The Craddock Terry Hotel and Event Center features an array of facilities and amenities to ensure a comfortable stay, including a unique European-style continental breakfast, delivered each morning, in-room Keurig machine and lobby coffee stations, a 24-hour fitness center, a 24-hour gift shop, a 24-hour business center, and concierge services. Other guest services include free parking, an overnight shoe shine service, a luxury sedan service to Amtrak and Lynchburg Regional Airport, and high-speed Internet access in all guest rooms and public areas. Additional guest services for an added fee include a rose petal turndown service, a welcome bouquet of roses, birthday cakes, shoe cake pops or truffles, champagne or sparkling cider and bike rentals. A 24-hour fitness center features an array of equipment, weights and machines to help stay fit, including cardio and elliptical machines, treadmills, stationary bikes, and a free weights section. A 24-hour business center offers the use of computers, printing and fax services and complimentary high-speed wireless Internet access. The Craddock Terry Hotel and Event Center offers distinctive venues and function facilities for truly memorable social events, weddings, business retreats and conferences. Featuring over 4,000 square feet of meeting and banquet space, which can be configured to create smaller spaces for various types and sizes of events and functions, the hotel also offers expert culinary teams to create customized menus and professional staff and events planning teams to help with all the details. One-of-a-kind, flexible meeting and event spaces can accommodate from 10 to 200 and include magnificent 2,100 square foot Granite Hall that can fit up to 200 guests; the beautiful 1,750 square foot Riverside Foyer for up to 100 guests and a large boardroom and three private dining rooms for between eight and 40 guests. Professional event services include event planning, onsite catering, featuring customizable menus, and a range of state-of-the-art, high-tech audio-visual equipment for all presentation needs. Stylish wedding packages include beautiful historic venues with a variety of flexible setups, stress-free event services, including personalized onsite catering, luxurious accommodations, award-winning onsite dining for rehearsal dinners and a range of extra services, such as rose petal turndown services, welcome bouquets and more, on request. Founded in 1786, Lynchburg boasts small town charm with beautiful sweeping views of the James River and the famed Blue Ridge Mountains. An important city in the history of America, Lynchburg is not only home to Poplar Forest, the home of Thomas Jefferson, but offers a variety of exciting attractions and things to see and do. Check out Civil War battle sites and vast plantations, award-winning wineries, countless cultural and outdoor activities, and annual festivals. Local attractions in Lynchburg include an array of cultural attractions and outdoor activities such as seven historic districts, museums, galleries, community markets and theaters. Attractions not to be missed include the Academy of Fine Arts, Amazement Square, the Anne Spencer House, the Legacy Museum, Lynchburg Museum, Monument Terrace, the Renaissance Theater and Opera on the James. Fun-filled activities include the Blackwater Trail, the Community Market and the Rise Up Climbing Center. Downtown Lynchburg is also home to an array of locally owned boutique shops, bookstores, outdoor outfitters and clothing stores that boast a distinctly Southern charm, as well as antique stores, collectibles and classic furniture. Enjoy tasting at one of the many breweries in and around the town, and Lynchburg has a plethora of choices when it comes to dining with an array of restaurants serving all types of cuisine from “down home” Southern comfort food to haute cuisine. Lynchburg plays host to an array of festivals and events throughout the year, including the annual Chocolate Festival, Angel’s Race, The Garlic Festival, the Festy Experience Bluegrass Festival, the Harvest Jubilee and Wine Festival, the Lynchburg Beer and Wine Festival and the Lynchburg Music Festival.